If you live near Chelmsford the county town of Essex and want to go Paintballing then you are in luck, Mayhem paintball is less than 15 minutes by car from Chelmsford we are just the other side of Ongar down the A414. With 16 amazing scenarios Mayhem is not your average paintball site each paintball map is packed full from our arsenal of ex-military vehicles, aeroplanes, 2 anti-aircraft guns, Real Russian T55 Battle TANKs, and loads of armoured personal carriers such as Saracens, 432's and Russian BMP's. We put so much in to our venue hence why Mayhem is regarded as the best in the UK and we attracted so many schools, Cricket clubs, Rugby clubs and football clubs from Chelmsford each year. Unique to Mayhem goggles tailor made to our specification with double glazed lens so they don’t steam up and with a soft comfy foam so they don’t feel uncomfortable when you are wearing them and great protection. Mayhem offers the paintballing equipment we want when we play, also each field has its own safe area so you can take your goggles off in between each game and get them cleaned so perfect vision all day. 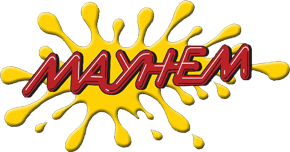 Mayhem is a UKPSF five star accredited venue so if you want to play Paintball at Mayhem or need more information on Chelmsford paintball call us on 01708 688 517.